The human lens is positioned in the anterior 1/3 of the globe and provides about 1/3 of the focusing power of the eye. The lens contributes to morbidity through cataract and other lens-based disorders, in addition, changes in the lens are associated with some systemic diseases such as christmas tree cataract in myotonic dystrophy, sunflower cataract in Wilson's disease, and lentiglobus in Alport syndrome. Nick's Tips: Nick’s Tips: The normal lens can be identified by its shape and position in the eye and by the absence of definable cellular features such and nuclei except in the cell of the anterior capsule and the lens bow. Additionally, the long fibrous cell lacking nuclei that run parallel to the adjacent capsule unambiguously identify lens under the microscope. Phakia in pseudophakia or phacoemulsification comes from the Greek, “Phakos” meaning lentil (a small bean roughly the shape of the lens). · Thinnest posteriorly – 2-9 mm (so be careful in cataract surgery). 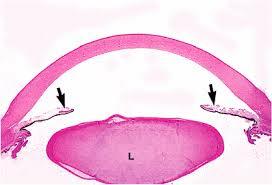 · Lens originates from surface ectoderm. Nick's Tips: Remember that these disorders are associated with systemic disease - Alport syndrome and Oculocerebralrenal syndrome. 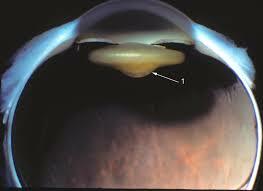 · Has an oil-drop appearance on retroillumination during slit lamp exam. Nick's Tips: Look for history of foreign body or trauma. Prussian blue staining will show iron.